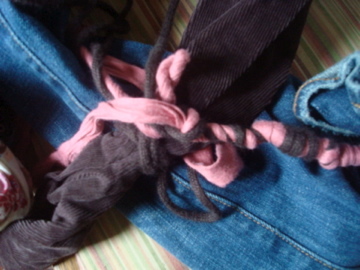 That’s four different articles of clothing thoroughly intertwined in one of the most intricate knots I’ve ever had the pleasure of undoing. And I had already removed two other shirts from the knot before I took the picture. What I want to know is, does this happen to everyone else? Is there some housewife laundry trick that I don’t know about that would save me from spending 30 minutes unwrapping my clean and dry clothes before I can even fold them? As a side note, my king-size sheets always come out of the dryer in a twisted ball, so if this is some laundry-related mistake that I’m making, at least I’m making it consistently. This entry was posted on Saturday, August 2nd, 2008 at 12:54 pm	and is filed under Dork Mom. You can follow any responses to this entry through the RSS 2.0 feed. You can leave a response, or trackback from your own site. When I wash our sheets, I check on them every 10 minutes or so to make sure it’s not rolling itself into a ball. It usually is and I just undo it. Not sure what to say about that clothes though! I have an answer! My parents use these and they do the trick. Hmmm… I might just have to try them. Even if they do come from a website called as seen on tv dot com. That might be the most ridiculous website I’ve ever heard of. Most of our laundry doesn’t do that, but the few items that DO, I put them in those net bags that are supposed to be for lingerie. That keeps them separate from everything else, but they still get thoroughly washed—and the bags are cheap. Tennis balls. Although the other dryer balls mentioned earlier might be quieter. I always sound like I’m drying a bushel of tennis shoes. well, the only timesssss that has happened to me was when i had a washer full of clothes and set the water setting on small load. 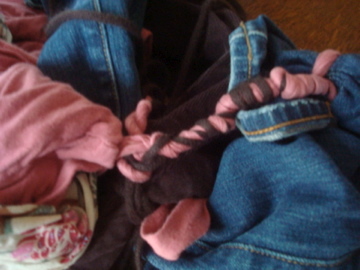 i had to call a sailor with knot expertise to untie it all. I have a pair of dryer balls and they don’t work.